Trainer Jerome Reynier (right) is all smiles as Marianafoot enters the winner’s circle after Pierre-Charles Boudot (left) rode him to victory in the Irish Thoroughbred Marketing Cup (Group 2) yesterday. While he couldn’t make the trip last year, this year, he not only entered Royal Julius for today’s million-dollar Thoroughbred feature, HH The Amir Trophy (Group 1), he saddled the winner in the USD200,000 Irish Thoroughbred Marketing Cup yesterday. 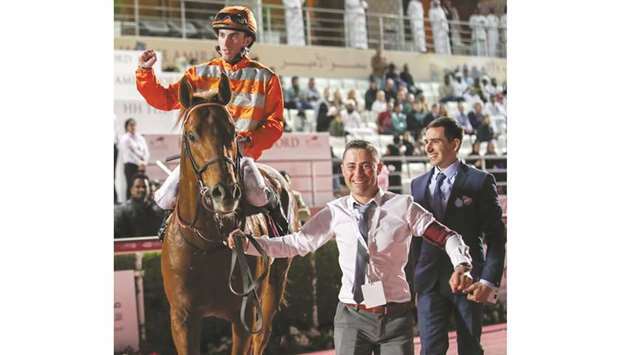 Pierre-Charles Boudot rode Marianafoot in the colours of Jean-Claude Seroul in the mile-long race at the Al Rayyan Park yesterday, and the 33-year-old trainer from Marseille was understandably ecstatic at the result. The Footstepsinthesand colt is Reynier’s second Group 2 winner, after Royal Julius won one in Italy last year. “Maybe I will only win Group races abroad,” he says with a smile. Royal Julius, who will be helmed by Gerald Mosse in the mile-and-a-half run today, Reynier says, has come a long way from the keen horse he was last year. “He has had a busy campaign last year, learning how to race without pulling too much. So we have been able to stretch him up to a mile and a quarter,” he says. There are a few things about Reynier that intrigue. He is one of the youngest trainers in France, who started working on his own six years ago. However, he is not short on results. Last season in France, he had 57 wins, for instance. Convincing people to try out new things, he says, is a challenge. “I guess to convince people (about opportunities) is pretty hard,” he says. “I didn’t talk to Mr. Seroul until I was sure that we were going to be invited. I told him about the opportunity, so he said, ‘okay, let’s try it out’. It’s a great experience internationally. Reynier did the Darley Flying Start, a training programme for young professionals in racing and breeding, and began training on his own in 2013. “It was a great experience, but now I want to try out things with my own horses,” he says. 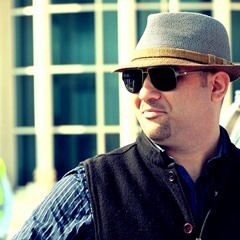 And so he is here in Qatar, his first outside mainland Europe as a trainer. “I am taking it as it comes. We have nothing to lose, and we are here to get the possible performances out of the horses here. If we are unlucky, that’s part of racing. And if we are lucky, we will have some nice results,” he says. Unlike many other trainers, who are generally based out of more popular training centres like Chantilly, Reynier has chosen to stay closer home near Marseille, in the south of France. Reynier’s father was an architect who was passionate about horses, and he has happened to pass that passion down to his son. “I used to be on the breeding side in the beginning. I have done the Irish National Stud Course and then the Darley Flying Start, but I really like the touch of the horse,” he says. And results he has got.